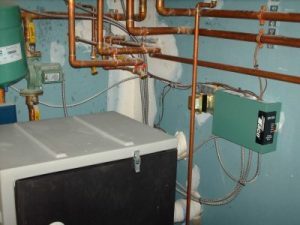 Gelinas HVAC offers Gorham Maine plumbing services to the residents and commercial business owners in the area. Our plumbing services include service/ repairs, replacement of existing fixtures and systems, kitchen and bath remodels, energy efficient upgrades, drainage, sump pumps, sewer/septic, winterizing of seasonal rentals, and irrigation/garden sprinklers. We know that plumbing is a critical component to any building as well as having the right plumber. Our licensed technicians are experienced and trained in all the latest systems, technologies and manufacturers. We like to treat your home or business as if it was ours. We arrive when scheduled, communicate your options, and preform the highest quality work. Gelinas is Elite Certified with many top manufacturers of plumbing fixtures and systems. We offer some of the best warranties in the business so you know your investment will serve your purposes for as long as you need them too. Our staff and technicians have been in the business for many years and that means we will listen to your needs as well as offer the best guidance on the best products and design our service to achieve perfection for your home or business. We always offer FREE Consultations and Estimates. Call us today at 207.885.0771 so we can provide a solution to your plumbing needs!